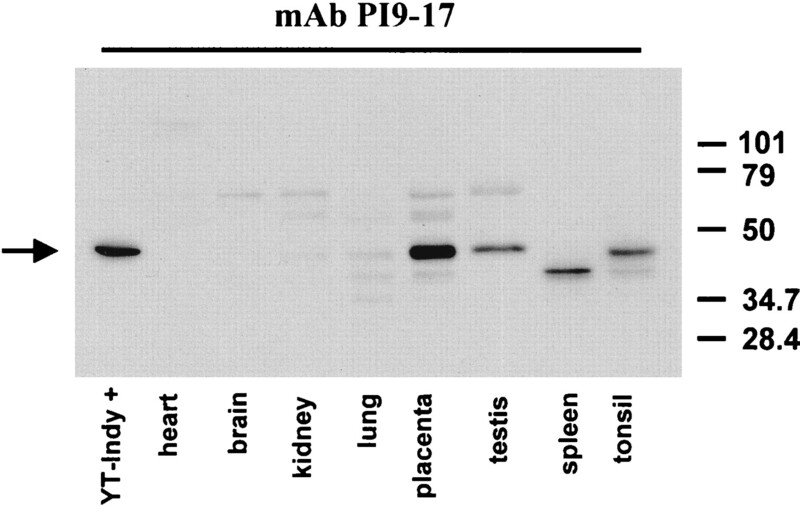 Anti-PI9 mAb 17 is specific for PI9. 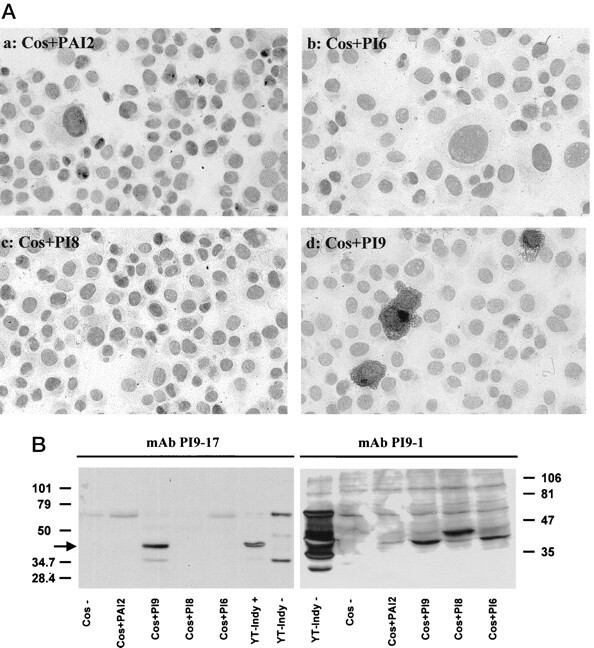 A, Cytospins of COS-7 cells transfected with PAI-2-pCI-neo (a), PI6-pcDNA3 (b), PI8-pcDNA3 (c), and PI9-pcDNA3.1/Hygro (d) were stained with 10 μg/ml mAb 17 as described in Materials and Methods. B, COS-7 cells were transfected with the above-mentioned constructs and lysed. Control cells were transfected with empty plasmid pcDNA3.1/Hygro. Also YT-Indy cells were lysed in the absence (YT-Indy −) or presence (YT-Indy +) of protease inhibitor mixture. A total of 15 μl COS-7 cell lysate and 5 μl (YT-Indy −) or 2.5 μl (YT-Indy +) 10-times-diluted YT-Indy cell lysate were analyzed by 10% SDS-PAGE and immunoblotting. Blots were incubated for 2.5 h with mAb 17 (left) or overnight with mAb 1 (right). The molecular mass of marker bands is indicated on the left and right. Immunohistochemical detection of PI9 in lymphoid tissues. 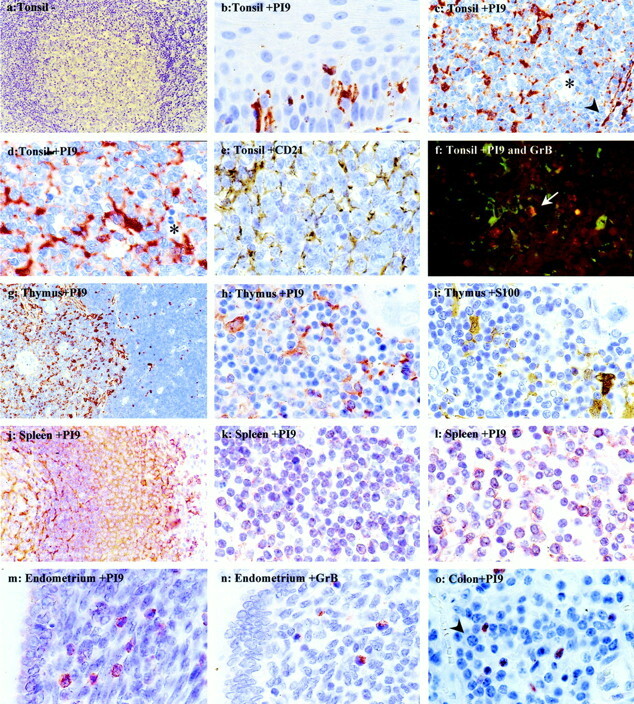 Tissue sections of tonsil (a–f), thymus (g–i), spleen (j–l), endometrium (m and n) and colon (o) were stained with a nonspecific isotype control mAb (a), anti-PI9 mAb 17 (b–d, g–h, j–m, o), anti-CD21 mAb 1F8 (e), anti-S100 polyclonal Ab (i), or anti-granzyme B mAb GB7 (n). Section f was double stained with mAb 17 and GB7. Magnification, ×400 (a, g, j), ×630 (c and f). Higher magnification (×1000) showing PI9 staining in Langerhans cells present in tonsil epithelium (b), dendritic cells in tonsil follicular center (d) and thymic medulla (h), B-lymphocytes in the mantle zone (k) and marginal zone (l) of the splenic white pulp, lymphocytes in endometrium (m), and a chronic inflammatory infiltrate in ulcerative colon (o). ∗, Tingible body macrophage PI9 negative; ▸, interdigiting cell PI9 positive; →, CTL expressing both granzyme B (red) and PI9 (green) in yellow; ▸, plasma cell PI9 negative. 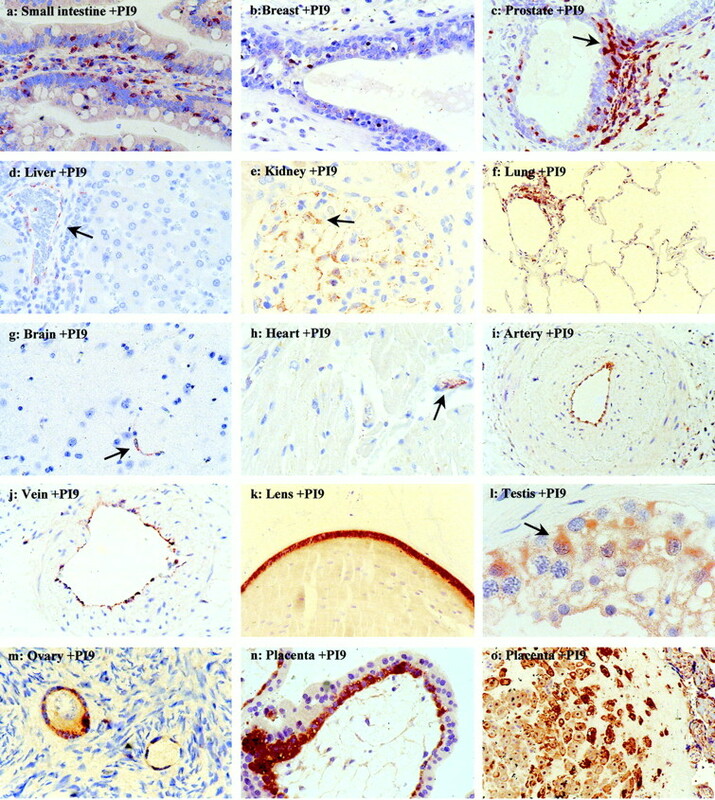 Immunohistochemical detection of PI9 in normal human tissues. The following tissues were stained for PI9: small intestine (a); breast (b); prostate (c); liver (d); kidney (e); lung (f); brain (g); heart (h); artery (i); vein (j); lens (k); testis (l); ovary (m); placenta villus (n), and intermediate trophoblast (o). Tissue sections were stained with anti-PI9 mAb 17 as described in Materials and Methods and counterstained with hematoxylin. Magnification, ×400 (b–f); ×630 (a, g–k, n, o); ×1000 (l, m). PI9 tissue distribution on Western blot. Five 5-μm thick sections of the indicated tissues were dissolved in 50 μl PBS plus 1% Nonidet P-40. Equal amounts of lysate protein (5 μg) were separated by 10% SDS-PAGE and analyzed by immunoblotting with mAb 17. For control purposes, 0.5 μl of 10-times-diluted lysate of YT-Indy cells, lysed in the presence of protease inhibitor mixture, were applied. The position of the molecular mass marker bands is indicated on the right.